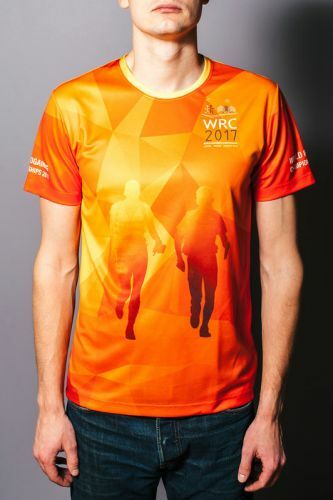 Comfortable and stretchy World Rogaining Championships 2017 T-shirt with blink of Golden rogainer’s motive. T-shirt is designed to keep you cool and comfortable on all your runs. Fast drying Dri-FIT is a high-performance, microfiber, polyester fabric that moves sweat away from the body and to the fabric surface. The legend tells that, if you see the blink of two rogainers in the sunrise or sunset while running in a long distance cross-country race, a great success will touch you! Details: Short sleeves, event logo, round collar, saturated colors. Material: 100% polyester, T-shirt is easy-care – machine wash at 40°C. *Male model is 183 cm, he wears a size medium on the picture. ©2016 wrc2017.rogaining.lv - All rights reserved.